Makeup face shading contouring technique by professional makeup artist. Portrait of a pretty woman having contouring face with highlighter in studio. Beauty Brunette Woman with Perfect Makeup. Beautiful Professional Make-up. Person perfect eyebrows. Skin care, foundation, contouring. 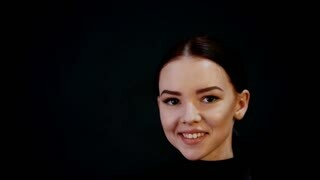 Beauty Girl's Face isolated on black background.